So, here's the draft cover for book 2 in the Eden Trilogy (Eden's Trial). The little 'spirals' will disappear in the final version and the font might change, but this is pretty much it, otherwise (comments welcome!). The vortex is a real feature in the latter part of the story, and as for the ankh symbol, well, you just have to read the books (it's on the cover of book one [The Eden Paradox], too, and will be on book three, Eden's Revenge). Just a cople of thoughts. Why not make the text bigger by putting "Eden's" and "trial" on separate lines and bumping the font size bigger. 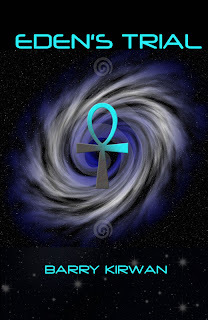 I really like the galaxy swirl, but find the ankh distracting. Not sure if the ankh is critical or not, but I would consider ditching it.